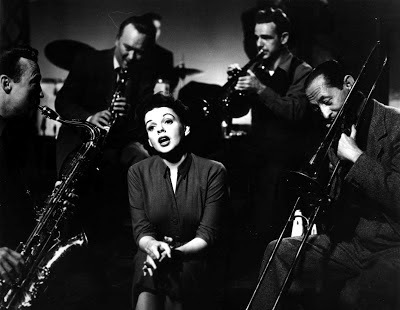 A Technicolor musical remake of the 1937 William A. Wellman melodrama starring Fredric March and Janet Gaynor, George Cukor's take promises James Mason and Judy Garland in the leads, a script by Moss Hart and songs by Harold Arlen and Ira Gershwin. The story concerns fresh-faced singer Esther Blodgett (Garland) and her discovery by fading movie star Norman Maine (Mason), the latter helping rebrand her as starlet "Vicki Lester", launching her movie career and marrying her, only for his own world to crumble around him into jealousy, alcoholism and despair. Maine and Lester's lives are heading in opposite directions - she is on the ascent, he is in decline - and Hart's screenplay finds a terrible poignancy in allowing their respective trajectories to intersect, a phenomenon that presents them with a few months of perfect happiness together that cannot last. This structuring and theme of the unstoppable pull of destiny called to mind David Fincher's The Curious Case Of Benjamin Button (2008) in which Brad Pitt's character, who ages backwards, finally reaches the right physical age to commence a relationship with his sweetheart Daisy (Cate Blanchett), only for his body to dwindle into infancy as she passes naturally into seniority. Another more obvious recent parallel with A Star Is Born is Michael Hazanavicius's overly praised silent homage The Artist (2011), which borrowed much of the plot of this already thrice-told tale and nevertheless proved popular among fickle mass market audiences with short memories (the two leads and Uggy the dog were, admittedly, utterly charming). 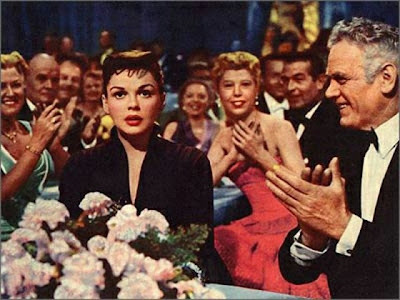 Although the boyish, doe-eyed Judy Garland is rightly celebrated for her touching and expressive performance here - few could do what she does - the real strength of Cukor's near-three hour showbiz epic is the decision to pair her brand of cheerily self-mocking musical comedy with Mason's sad and affecting theatrical approach. The Englishman is as impressive here as a bi-polar drunk as he would be in Nicholas Ray's later Bigger Than Life (1956). The chemistry between Garland and Mason is considerable and both give each other space to work. She gets to showcase her vocal versatility with a selection of show tunes, he gets to walk forlornly into the ocean, never to return. Indeed, so even is the focus on Mason's doomed Norman Maine, whose demise dominates the picture's second-half, it could easily have been called A Star Dies. 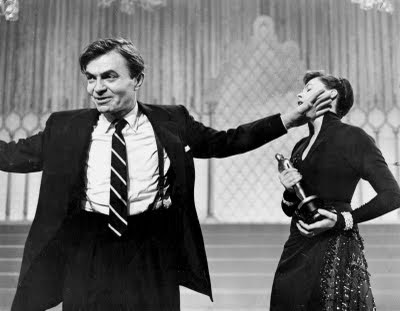 Other noteworthy performances include those from Charles Bickford as sympathetic studio boss Oliver Niles and Jack Carson as his cynical chief of publicity Matt Libby, a shrewd media manipulator embittered by years of having to conceal Maine's morose drinking binges from a scandal-hungry tabloid press. As a satire of the Hollywood dream factory, A Star Is Born is far less critical of the industry and its personalities than Sunset Boulevard (1950) or The Bad & The Beautiful, directed by Garland's ex-husband Vincente Minnelli two years before. Niles may always be business-minded but he remains friends with his stars and is concerned for their welfare while Libby is faultlessly professional for just as long as he needs to be. The studio's frantic costume and make-up departments and the occasional sleazy producer are rightly sent up but these are easy targets and overall the filmmaking community is not the real villain here: people's personal demons are their own and stars bring joy to millions. A sappy conclusion from Warner Brothers that lets down the film's otherwise sharp insights into the nature of fame. Maine prostituting himself by exchanging photographs for drinks is much more like it.